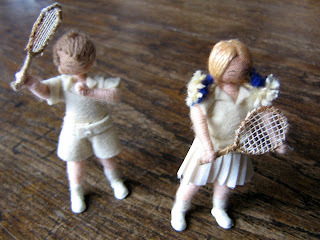 www.danielagnew.com: Anyone for tennis? 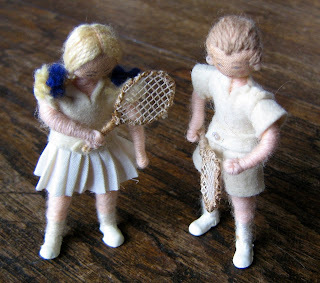 Caco dolls' house tennis player dolls. Anyone for tennis? 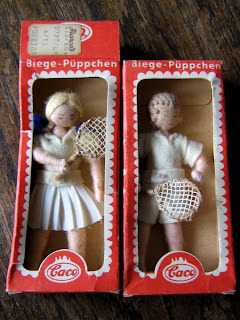 Caco dolls' house tennis player dolls. This four dolls are about 2.1/2in. high, they come in their original boxes with Harrods price labels, 1950/60s. They are made by the German company, also sometimes called Caho. These are very unusual as they have cloth heads, just like Grecon dolls. Infact I sold one pair on eBay and I was told by someone that they were Grecon dolls and not made by Caco. 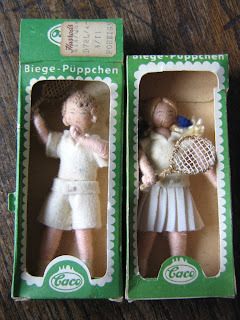 I can't believe this, because they are so mint and the boxes even show tennis players on the side, I suspect for a short time Caco tried making cloth headed dolls, to compete with the popular Grecon dolls in the UK. I have shown them to Olivia Bristol, who is well respected in the doll and dolls' house world and she agrees. I would love to hear your thoughts and experience about these dolls, do you know other cloth head Cacos? What sweet little dolls, and how interesting! It seems quite possible that Caco, which normally had metal or plastic heads and hands, tried out cloth ones. These look mint, so if they were Grecon dolls, you'd expect them to have labels. And having two pairs each with boxes seems pretty convincing! I collect Erna Meyer dolls - most have painted facial features on stockinette heads, and cloth hands, whether they have cloth feet or plastic feet. But for a while, Erna Meyer also made dolls with plastic heads and hands - I have one in its box, and I've seen others, also boxed. I must have seen them on ebay without recognising them as Erna Meyer, because they're hard to distinguish from Caco or some Lundby dolls. Perhaps some German collectors will know more about Caco dolls and whether they experimented with different media?